Condition: New product PRM-9000 Geiger Counter - Nuclear Radiation Contamination Detector & Monitor By Mazur Read More Specs in More Info. Read about one of best called Radiation Meter Called the Inspector Vs. The Mazur. Check out the advantages why the Mazur is better than the compitition. 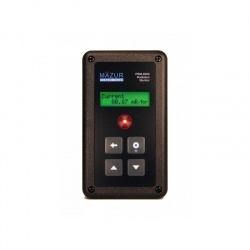 Condition: New product PRM-7000 General Purpose Geiger Counter By Mazur Read more specs in More Info. Read about one of best called Radiation Meter Called the Inspector Vs. The Mazur. Check out the advantages why the Mazur is better than the compitition. Condition: New product PRM-8000 Geiger Counter - Nuclear Radiation Contamination Detector & Monitor By Mazur Read More Specs in More Info. Read about one of best called Radiation Meter Called the Inspector Vs. The Mazur. Check out the advantages why the Mazur is better than the compitition. The RDS-30 is a Digital Handheld Dose Rate Meter designed for a wide range of applications. Perfect for first responders, civil defense, industrial radiography, or as a radiation survey tool for oil & gas pipelines. Extreme ease of use and durability make the RDS-30 perfect for any general purpose radiation survey application. Read about the advantages this model versus the Inspector or the competition at the bottom.. The PRM-9000 includes the same two-inch (50.8 mm) pancake Geiger detector tube that is the gold-standard for surveying areas for potentially harmful ionizing radiation levels and for detecting radioactive contamination of packages, items, equipment and people. The instrument is suitable for regulatory inspections, and for the detection, measurement and monitoring of broad spectrum, low energy radionuclides, including Naturally Occurring Radioactive Material (NORM). The detection sensitivity combined with the feature-set outlined below results in one of the most compelling price/performance values in the industry. Accurate, reliable, made in the USA, the PRM-9000 Geiger counter is an ideal solution for individuals, health physics professionals, educators, researchers, outdoor enthusiasts and rock collectors. The instrument is designed to continuously collect measurements and statistics enabling complete environment assessment. This vital capability is not available on similarly priced products. Using only one key, users can scroll through several screens that display present, average, maximum and minimum measurements in uR/hr, mR/hr, uSv/hr, Counts per Second (CPS) or Counts per Minute (CPM). This nuclear detector not only records the maximum radiation measured, but also displays the time and date at which the maximum reading occurred. Conventional Geiger counters require the user to be looking at the radiation meter to capture such events. The two-line, alphanumeric display supports both English and Japanese languages promoting ease-of-use and concise measurement. The display is backlit to support low-light conditions. 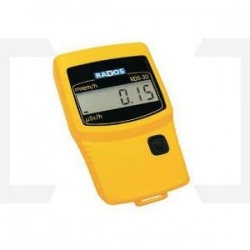 The battery life of this radiation detector and monitor is over 4 1/2 years under normal conditions from a single, readily available, 9-volt lithium battery that is user-installable without soldering. Standard alkaline 9-volt batteries, available virtually everywhere, provide over 2-years of life under normal conditions. With over 100K bytes of internal data logging memory included, this Geiger counter can autonomously (without the need for a PC) store up to 91,466 minutes or hours of time-stamped measurements. These measurements can then be uploaded later to a PC in CSV format for analysis. A user-settable dose rate alarm sounds an audible alert when the measured radiation level exceeds that of the alarm level setting. Designed by Mazur Instruments and manufactured in the USA, the PRM-9000 Geiger counter and nuclear radiation monitor includes abundant I/O options including support for headphones, external speakers, external power and USB data exchange (Requires Optional 3.5mm to USB Adapter Cable). Visual Indicator LED pulses on and off when a radiation detection event occurs. LED can be disabled. Audio Indicator Tone beeps when a radiation detection event occurs. Audio three volume levels and can be muted. Audio Output / Digital Interface Standard 3.5mm jack with three selectable volume levels for output to audio systems, computer speakers or media player headphones. Independently tested and found to be substantially compliant with FCC requirements for home use. Approval to display FCC logo pending. 1. Assuming that background radiation is less than 85 CPM, the device is using the low-power setting and temperature of operation is 25° C (77° F). • The PRM-9000 provides Inline Statistics and is designed to be always keeping average, maximum and minimum recorded values. The PRM-9000 also tells the user when (Time and Date) maximum measurements were recorded. This is important because users can assess their environment quickly and in an ongoing manner. They can also catch one-time events (such as an X-ray pulse) that may occur when they are away from the unit or sleeping. With the Inspector, you must be watching the unit to know the measurement. There is no unattended function with the Inspector. • The PRM-9000 uses a two-line text display and with one key, users can scroll through pertinent values to size up their environment. Users can also setup timed measurements with intuitive text menus. The Inspector uses a 7-segment LCD. • The PRM-9000 has a backlight for low-light conditions, the Inspector does not. • The PRM-9000 has internal logging of measurements that can later be uploaded to a PC, the Inspector does not. • The PRM-9000 has a USB option, the Inspector has no PC interface options. • The PRM-9000’s maximum reading is 125 mR/hr the Inspector is 110 mR/hr. • The PRM-9000 has a headphone jack designed to be used with ear-buds, with three difference audio volume levels, the Inspector does not offer this level of audio control. • The PRM-9000 relies on a tactile membrane keypad sealed from the environment, the Inspector uses slide switches and push buttons that air open-air. • The PRM-9000 has an internal day-date clock, the Inspector does not. With a Mazur Instruments PRM-8000 or PRM-9000 You Can: Check granite countertops, water filters, air filters, building materials and other items in your home for radioactive contamination Check for radioactivity in antiques, watch and clock dials, antique pottery, smoke detector, lantern mantels, etc. Monitor and maintain awareness amidst a nuclear accident or emergency Test for radioactive contamination of food Check for radioactivity in metal objects in your home or office that could be made of recycled radioactive materials Check for leaks or possible exposure if you work in or near an X-ray lab in a medical facility or medical office suite Check for environmental levels of radioactivity near a nuclear power facility Test the soil and environment for dangerous levels of radioactivity, if are in close proximity to uranium mines Monitor personal levels of radiation due to radiation therapy, brachytherapy or other medical procedures that rely on radioactive substancesExamples of what Geiger counters do not detect: Neutron radiation Microwave radiation Cell phone and smart meter radio frequency (RF) electro-magnetic field (EMF) radiation Radon gas (Test kits available in home improvement stores) Laser energy About Nuclear Radiation Nuclear radiation is a normal part of our planet and the cosmos. It is also a by-product of man-made actions and activities. The unfortunate catastrophe in Japan has created a new sense of urgency for personal radiation measurement to an entirely new generation of post-Cold War individuals. Against this backdrop we will provide a fundamental description of how a Geiger counter detects nuclear radiation. First a few words on radiation, and a particular type called ionizing radiation. Radiation is all around us. The sun radiates energy, radio stations radiate electromagnetic waves and radiators in apartment buildings radiate heat to keep residents warm in cold weather. However, nuclear radiation is a different type of radiation known as ionizing radiation. Ionizing Radiation - Four Primary Types Ionizing radiation alters the structure and, by association, the electric charge of individual atoms by a process known as ionization. The substances that produce ionizing radiation are said to be radioactive. There are four primary types of ionizing radiation – alpha, beta and gamma radiation as well as x-radiation (x-rays). Generally, an alpha particle can travel no more than one to three inches in the air before stopping, and can be stopped by a piece of paper. However, they can pass through a thin mica window. As we will see later, this property of mica is very important in radiation measurement. Beta radiation can pass through a sheet of paper and some clothing, but not through thin metal or glass. Beta particles can damage skin, however, both alpha and beta radiation are most harmful when inhaled or ingested. Gamma radiation occurs naturally in nature and is almost identical to x-rays. Generally, they can travel into and often times through anything. Gamma particles can be shielded with several feet of water or concrete, several inches of steel, or a smaller amount of lead. X-radiation is man-made radiation with a number of valuable uses in medicine and dentistry. X-rays are electromagnetic radiation of the same nature as light and radio waves, but they are also ionizing. They can penetrate a variety of materials, including body tissue. The shielding techniques for x-rays are similar to those for gamma radiation. This is why the x-ray technician will wear a lead apron when taking x-rays. The Geiger–Müller Tube Having discussed the nature of radiation and the four primary types of ionizing radiation, we will now move to discussing how a Geiger counter operates. Please see the figure below for the following discussion. Having discussed the nature of radiation and the four primary types of ionizing radiation, we will now move to discussing how a Geiger counter operates. Please see the figure below for the following discussion. The key element within a Geiger counter is a Geiger tube that consists of two electrodes separated by a mixture of gases. High voltage is applied to the electrodes which creates an electrical field within the chamber. When radiation passes through the chamber and ionizes the gas, a pulse of electrical current is generated. This detection will typically result in a flashing of an LED and sounding of a “beep” on most Geiger counters. The pulses are electronically processed by the instrument and the radiation level measurement is displayed. The mica window on the tube allows alpha particles to pass so that they can be detected. Some Geiger tubes only detect beta and gamma radiation leaving users blind to the presence of alpha particles. Detecting alpha radiation is very critical because as radioactive substances decay they oftentimes decay into elements that produce alpha radiation. If these elements find their way into the food supply, individuals risk consuming food that contain alpha particles. This is one of the key reasons that, at present, demand for high-quality, US-made, alpha-detecting Geiger counters is at record levels in Japan. Read about the advantages this model versus the Inspector or the compitition at the bottom.. The PRM-7000 is built upon the same long battery life, high quality, made in the US, platform as the PRM-8000 and PRM-9000, which have been the choice of governments, organizations and individuals around the world.The instrument is designed to similar specifications as devices used by firefighters, HAZMAT teams, paramedics and other first responders to address the radiation hazards they face. Unlike other instruments in this price range, the PRM-7000 can be calibrated to the official international standards of accuracy required for regulatory work. An actual NIST-traceable calibration report example can be reviewed here. Mazur Instruments uses only genuine detector tubes, made in the US, by LND in all of its products and does not rely on imported, cloned or “knock-off” detector tubes present in some lower priced products. Accurate, reliable, made in the USA, the PRM-7000 Geiger counter is an ideal solution for individuals, health physics professionals, educators, researchers, outdoor enthusiasts and rock collectors. The battery life of this radiation detector and monitor is over 6-years under normal conditions from a single, readily available, 9-volt lithium battery that is user-installable without soldering. The supplied standard alkaline 9-volt batteries, available virtually everywhere, provide over 3-years of life under normal conditions. Designed by Mazur Instruments and manufactured in the USA, the PRM-7000 Geiger counter and nuclear radiation monitor includes abundant I/O options including support for headphones, external speakers, external power and USB data exchange (Requires Optional 3.5mm to USB Adapter Cable). 1. Assuming that background radiation is less than 25 CPM, the device is using the low-power setting and temperature of operation is 25° C (77° F). Scan items for nuclear radiation, detect Naturally Occurring Radioactive Materials (NORM) and continuously monitor your environment. The meter delivers laboratory grade performance in a compact unit and measures alpha, beta, gamma and x-radiation. Accurate, reliable, made in the USA, the PRM-8000 Geiger counter is an ideal solution for individuals, health physics professionals, educators, researchers, outdoor enthusiasts and rock collectors. Standard alkaline 9-volt batteries, available virtually everywhere, provide over 3-years of life under normal conditions. A user-settable dose rate alarm sounds an audible alert when the measured radiation level exceeds that of the alarm level setting.Designed by Mazur Instruments and manufactured in the USA, the PRM-8000 Geiger counter and nuclear radiation monitor includes abundant I/O options including support for headphones, external speakers, external power and USB data exchange (Requires Optional 3.5mm to USB Adapter Cable). • The PRM-9000 has been judged by numerous users to have a considerably better look, feel and build quality over the Inspector. There is no comparison when you look at both units side-by-side. RDS-30 is a digital handheld dose rate meter designed for a wide range of applications involving a possibility for abnormal radiation levels.